The San Diego Gulls broke a tie with three third-period goals and Corey Tropp and Chase De Leo both scored twice in a 6-4 victory over the Ontario Reign on Friday evening in Ontario. Rookie Jack Kopacka tucked in his own rebound two minutes, three seconds into the third period to give the Gulls the lead for good. Corey Tropp was credited with the lone assist on Kopacka’s fourth goal in his nine-game professional career. Tropp increased the Gulls lead to 5-3 with 7:35 to play when he put a shot past Cal Petersen for his 12th goal of the season. DeLeo gave the Gulls a 6-3 lead when he put in the rebound of Sam Carrick’s shot with 5:46 remaining for his 13th goal. The Gulls comeback began with 11:26 left in the second period when rookie Max Jones scored an unassisted goal on an end-to-end rush. Tropp opened the scoring 2:24 into the first period when he skated in front of the next and put a shot through Petersen’s legs. 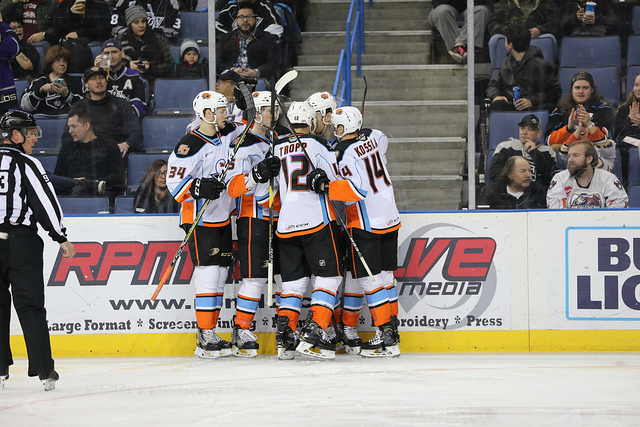 The Gulls (25-14-2-3) took a 2-0 lead 1:40 later when De Leo tipped in a shot from the point by Andrej Sustr. The Reign (14-23-4-2) scored the next three goals. Matt Moulson scored on a wrist shot with 1:00 left in the first period. Philippe Maillet scored from the right faceoff circle 1:30 into the second period. Moulson scored on the only power-play opportunity for Ontario, the Los Angeles Kings American Hockey League affiliate. The goal was Moulson’s team-leading 21st of the season. Reign left wing Bokondji Imama scored the game’s final goal on a wrist shot with 1:12 to play before a crowd at Citizens Business Bank Area announced at 8,927. Gulls goaltender Jeff Glass made 28 saves in his first appearance since Jan. 25, improving to 6-5-1-1, including a 3-1-0-1 record with the Gulls. Kevin Boyle, who has played in 30 of the Gulls 44 games, starting each of the previous four, was recalled from loan by the Gulls NHL parent team, the Anaheim Ducks, earlier Friday. The Ducks were seeking another goaltender after John Gibson suffered an upper-body injury in the second period of Thursday’s 4-0 loss to Ottawa Senators that forced him out of the game. The Gulls recalled goaltender Angus Redmond from the South Carolina Stingrays of the ECHL Friday to serve as their No. 2 goaltender. The Gulls led in shots, 39-32, including a 15-4 edge in the third period. The Gulls were scoreless on their five power-play opportunities. Petersen (5-12-2-1) made 33 saves for Ontario, two days after making 37 in a 6-3 victory over the Gulls at Pechanga Arena San Diego. The victory was Gulls coach Dallas Eakins 300th in the AHL, the 21st coach to achieve that milestone. His career AHL record with the Gulls since 1995 and Toronto Marlies from 2009-13 is 300-199-27-34.